Long time readers know all about the struggles we’ve had finding the right math fit for my oldest, Bug. He’s just about 8, and he’s a bit of an oddity. The kiddo eats up math. He catches on to concepts quickly and the farther he gets in his math studies, the more I feel like *I* need some support to teach him correctly. 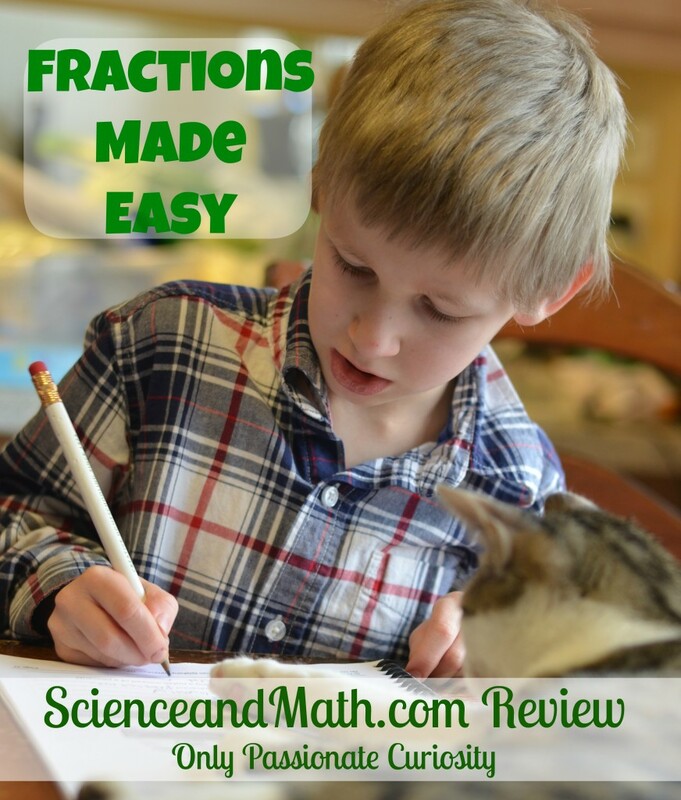 I was so relieved to be sent Mastering 5th Grade Math – Volume 1 – Essentials of Fractions from ScienceandMath.com to review with him, because fractions especially are a huge weakness for me. What is Mastering 5th Grade Math – Volume 1 – Essentials of Fractions? Essentials of Fractions is the first DVD in ScienceandMath.com’s new Mastering 5th grade math series. There are four volumes in all, but each can be used as a stand alone if you desire. The video lessons are on a DVD, and are also available in MP4 form on the second disk to watch on your computer or mobile device if yours can play those file types. The DVD comes with a PDF workbook and answer key to be used along with the DVD lessons. The PDF workbook is black and white, with a clean layout, and plenty of room to work out the problems on the page. Bug tends to get overwhelmed with crowded worksheets, but this layout didn’t bother him at all, and the lines were large enough for him to write on despite his little boy sloppy handwriting. Volumes 2-4 (not featured in this review) teach how to add and subtract fractions, multiply and divide fractions, and long division/multiplication. This DVD was very well received by Bug. He loves any kind of math that he can soak up quickly, and not have to do too much repetitive work. I printed out the workbook for him, handed him the DVD and let him dig into his lesson. Each chapter has 2-3 pages in the workbook for him to do, and I asked him to work on just one workbook sheet each day. I did have him watch the lesson each day before opening his workbook, so this means he got to see each lesson 2-3 times total. For example, for the chapter on finding the greatest common factor, there are 3 workbook pages, so he watched the lesson three days in a row. The lessons themselves are quite simple, they show the teacher in front of the whiteboard without any flashy effects or graphic. This is exactly the kind of teaching you would get in a 5th grade classroom, only you don’t have any kids in the peanut gallery interrupting the lesson. The teacher demonstrates the new skill, and then does a handful of sample problems. Then, you’re off to give it a try on your own. I always watch the DVD with Bug, because somehow, I missed how to do fractions in school (a long story involving moves, and switching classes, and missing that unit all together!) and I really, really needed a crash course myself on topics like finding the greatest common factor. Between the DVD lesson, and the teacher’s answer key, I didn’t struggle at all to teach this program. I enjoyed this DVD enough that I have already penciled in the other two fractions DVDs on our curriculum wishlist for later in the year. I liked how clearly the instructor taught, and how the fraction concepts were broken down into small, bite sized chunks. Mastering 5th Grade Math – Volume 1 – Essentials of Fractions is perfect for visual and auditory learners. It is especially good for kids who are accelerating math and want a quick, no frills approach to fractions. It would be equally good for kids who need to remediate fractions. This DVD is recommended for kids in the 4th-6th grades, however, the content is not “cutesy” so even children much older than 5th grade can review with this program. 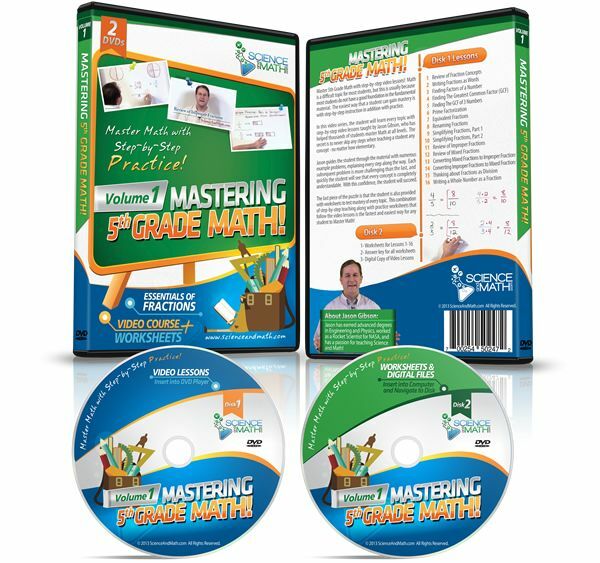 You can get the DVD Mastering 5th Grade Math – Volume 1 – Essentials of Fractions from ScienceandMath.com for $15.99. If you need it now, they have a download option which is available of $14.99.